MWF in coordination with CDA Region VII and the LGUs of the cities of Cebu, Naga and Talisay mobilized and empowered more than 3,500 cooperative members to take action towards economic development. In this photo are the chairpersons of partner cooperatives along with Manila Water Philippine Ventures VisMin Business Development Manager Erique Yu, City of Naga Administrator Engr. Arthur Villamor, MWF Executive Director Carla May Beriña-Kim, City of Naga Councilor and CCDC Head Rodrigo Navarro, City of Naga Agriculturist Victor Rabor and Region VII Cooperative Development Authority Specialist Ruben Delfino. ​More than 3,500 community-based cooperative members from three Cebu cities were recently empowered to contribute to nation-building through sustainable economic development at a community level via non-interest bearing loans and skills improvement trainings. 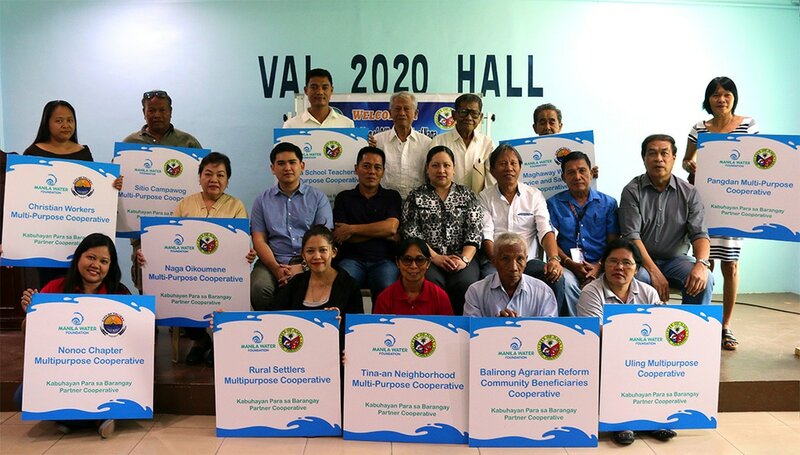 In coordination with the Cooperative Development Authority Region VII and the local government units of the cities of Cebu, Naga and Talisay, Manila Water Foundation (MWF) mobilized and capacitated 16 cooperatives and gave them the opportunity to either expand their existing businesses or venture into new ones through its Kabuhayan Para Sa Barangay (KPSB) program. KPSB, which is MWF’s flagship community assistance and livelihood program, provides PhP100,000 worth of non-interest-bearing loans to community-based cooperatives all over the Philippines. Aside from the financial assistance, KPSB partner cooperatives also enjoy relevant trainings to help them manage and operate their businesses better. This package ensures holistic and sustainable progress for cooperative members and their respective families. This kind of progress, together with the promise of a fresh start, is what members of Naga School Teachers Multi-Purpose Cooperative (NSTMPC) look forward to. According to its Chairman, John Roy Ravina, the soft loan they received from MWF will help them explore new businesses. “Yung binigay ng Manila Water Foundation na tulong sa amin, yun ay mapupunta sa aming planong mag-tayo ng swine raising business. (The loan we received from Manila Water Foundation will be used to put up a swine raising business.) Also, we want to move towards the direction where we can put up other kinds of business like a consumer store where our members can go and purchase their needs [at a more affordable price],” he said. Aside from new business ventures that will enable positive changes among the members of NSTMPC, Chairman Ravina assured that they will also extend the opportunity that they have received to those at the community level. “One way to help is to give assistance to our members who are public servants and that is possible through the additional funding we just received from Manila Water Foundation,” he remarked. City of Naga Councilor and City Cooperative and Development Council (CCDC) Head Rodrigo Navarro also highlighted the importance of the financial assistance given by MWF and the benefits that the cooperative members will reap in the long run. “Kailangan po talaga namin ng tulong pinansyal para sa karagdagang kapital para makatulong sa pag-unlad ng mga kooperatiba lalo na at nagsisimula pa lang sila. Kapag may ginansya ang mga kooperatiba, may makukuha ang mga miyembro. Malaking tulong po ang binigay na financial assistance ng Manila Water Foundation at malaking karangalan po ito[ng partnership na ito] para sa amin,” (Our cooperatives really need additional capital, especially since they are just starting. If the cooperatives earn profit, the members get shares. The financial assistance we received from Manila Water Foundation is indeed a great help. It is an honor to become Manila Water Foundation’s partner) he quipped. The remarkable turnout of KPSB applicants in Cebu served as a validation of MWF’s unwavering faith in the importance of sustainable livelihood opportunities to organized groups such as community cooperatives in boosting the local and national economic growth of our country. Thus, it was very fitting that MWF Executive Director Carla May Beriña-Kim reiterated what the organization envisions during the check turnover held in Naga City. “The bigger objective of Manila Water Foundation is to help in nation-building. Of course, we won’t be able to do that unless we can strengthen and boost local economic development and the perfect partners for this are the cooperatives because of your objectives and aspirations to become very strong in terms of your business enterprise and to generate employment for the community members as well,” she stressed. To date, 427 community-based cooperatives in the country, or more than 120,000 families, have been assisted by the KPSB program.